A few weeks ago, when there was a glut of ripe plums coming in from the neighbors, Ken thought to preserve some of them in alcohol. 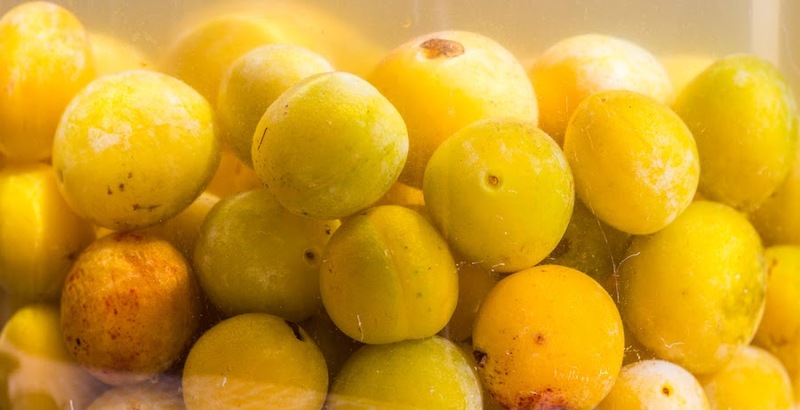 He put a batch of plums in a large jar with white rum and sugar. They'll macerate in the cellar for a few months and then we'll have two things: the fruit and the flavored rum. Both will be good for cooking and the rum should be good for sipping. Neither of us usually drinks rum, but the fruit-flavored version might be tasty. We'll see. Plums in rum and sugar. Tasha went back to the vet's on Wednesday. She may have a light urinary tract infection. She's been having trouble peeing, and she had a couple of accidents in the house on Wednesday morning, something she hasn't done in almost two months. When we take her outside she squats several times with only a few drops as the result. According to some internet sites, these could be the symptoms of a kidney infection or a UTI. I suspect that, because of the cone, she can't lick her private parts to keep them clean, providing an opportunity for bacteria to settle in. So, the doctor looked her over and basically said, "well, it's possible." Except for the urination issues, there are no other serious symptoms. She's eating normally and is full of energy. So she's on a run of antibiotics and back on the anti-inflammatory pills for a week. Since seeing the doctor, there have been no more accidents in the house (knock on wood), and she pretty much slept normally through the night. I'll be happy when her stitches come out next week and we don't need the cone any more. The heat wave has broken, at least that's what the weather people are saying. It should be much cooler today, and the next few days are going to feel downright chilly. Again. This summer has been a series of hot and cold. Makes me wonder what winter will be like. 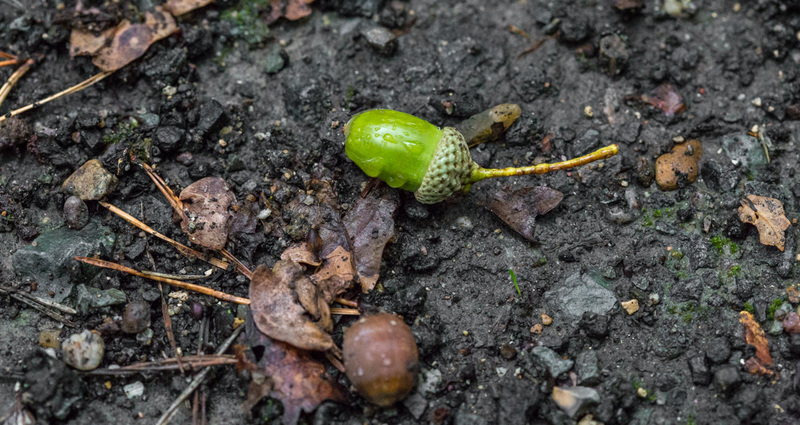 A still-green acorn on the ground. In the meantime we have fall. The signs of summer's end are all over. I can feel the crunch of acorns beneath my feet when I walk with Tasha. It won't be long before the chestnuts fall and litter our road with their husks which, like every year, get mashed into a puree by cars. As promised, here are a couple of photos of Tasha wearing her "cone of shame." It's called une collerette vétérinaire in French, but they also know the name cône de la honte (cone of shame) from animated Pixar movies. This one is made of clear plastic, so she can see through it. 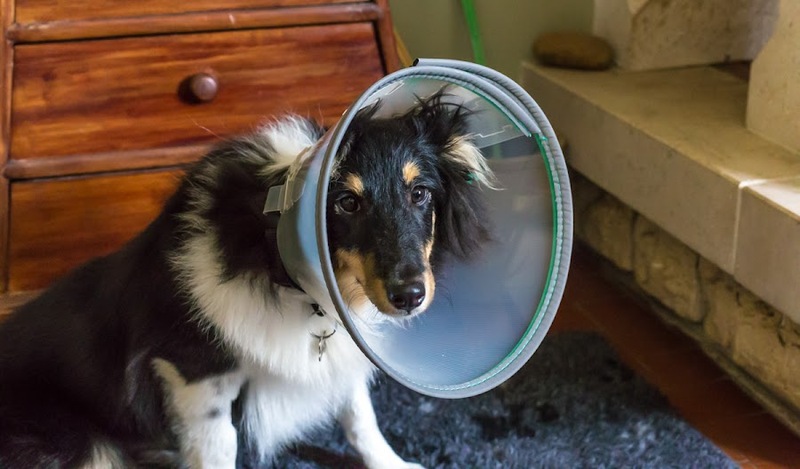 Tasha models her cone, which is attached to her collar, on day one. Not happy at all. On the first day, Tasha was not a happy camper. She did not like the cone much and looked rather depressed about having to wear it. After the second day, however, she's just as normal as can be. She even sits up willingly when we put it on her. We do take it off for meal time and walking. On Monday she actually climbed the stairs with it on for the first time. Now the cone doesn't bother her. I think she can pick up HBO on that thing. 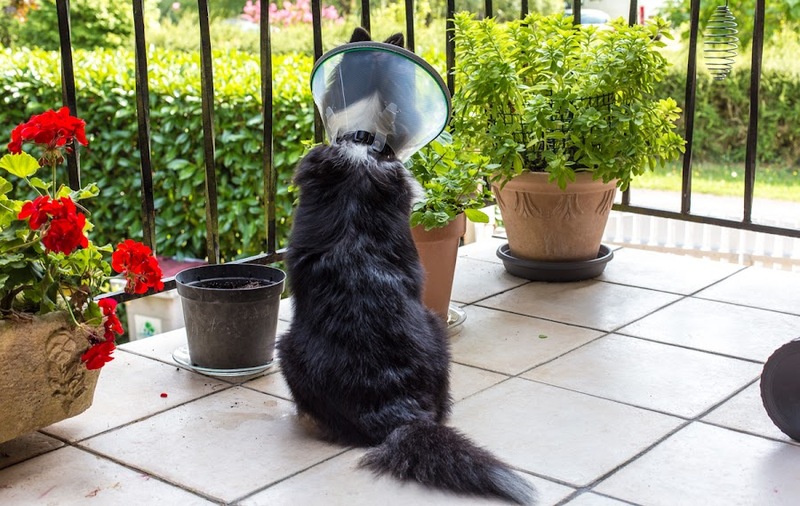 She still has the urge to lick her stitches and staples, so the cone will stay on until either she stops doing that or until September 7, the day her stitches and staples are scheduled to be removed. The past few days have been, and the next few are predicted to be, very summery. I know, I've been mentioning it. But it's worth mentioning. It's been a very strange summer. This may be the last warm spell. Or not. The caprices of a temperate climate. 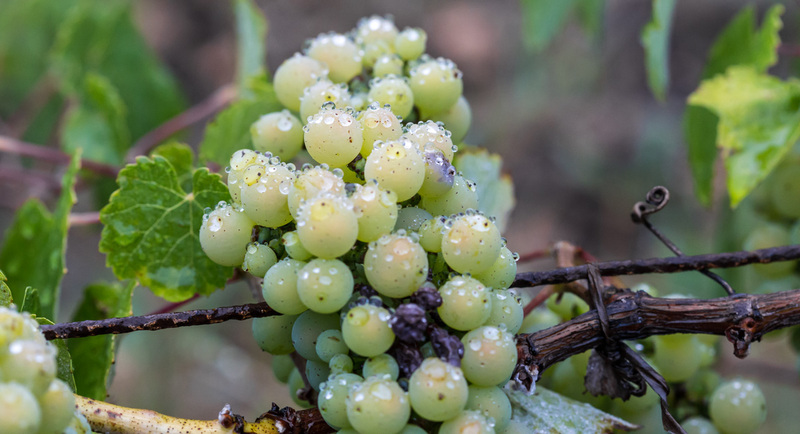 Back when it rained last, these grapes were covered in raindrops. The heat is good for our garden, and I'm hoping it's good for the vineyards as well. We're planning to have BLTs for lunch today, with French fries. Yum. Tasha is getting used to the "cone of shame." The first day was difficult. She seemed kind of depressed about it. But now she's learning to live with it. I think she might think that it's what happens to dogs. She doesn't know any different. Still, we take it off frequently for her meals and walks in the yard. I think she's being a good sport. I'll show you a photo on Tuesday. 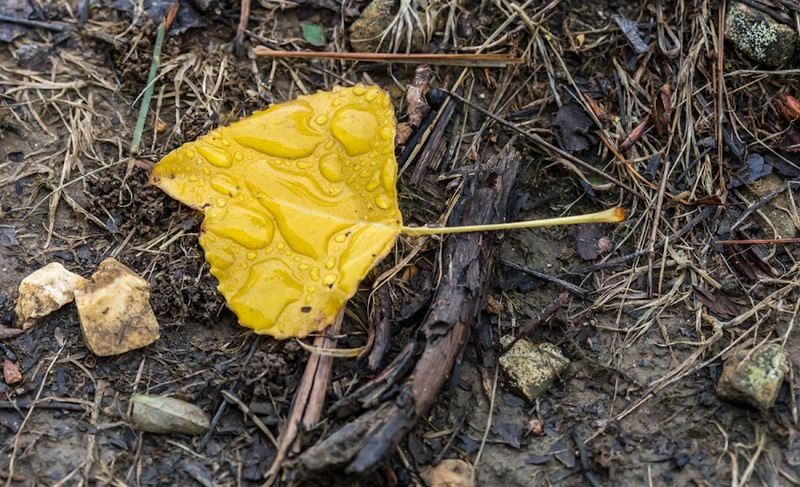 Pine needles stuck to a leaf after a rainstorm. We feel bad about it all, of course. 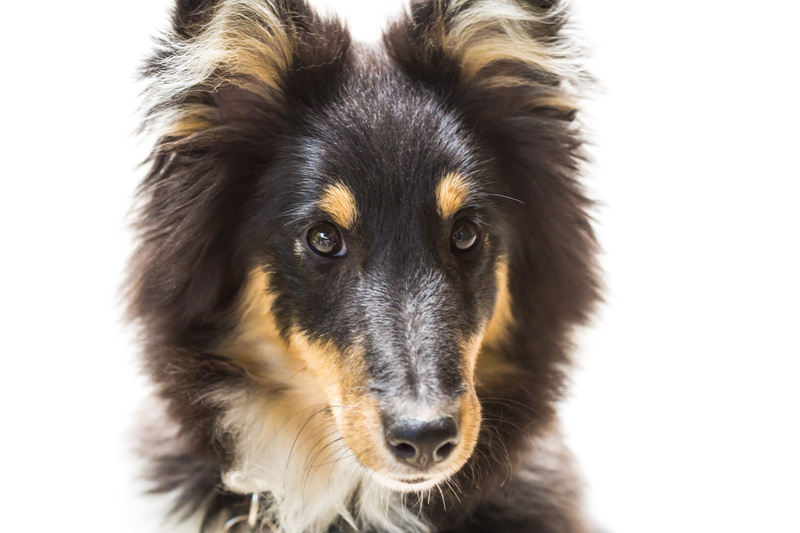 It's new to us, since Callie never tried to pull her stitches out, and she had two surgeries in her first year. But, as strange as it is, it's all temporary. Soon it will be a memory and things will be back to normal. And that makes sense, since we're nearing the end of August. The tomatoes are enjoying the heat and ripening fast. 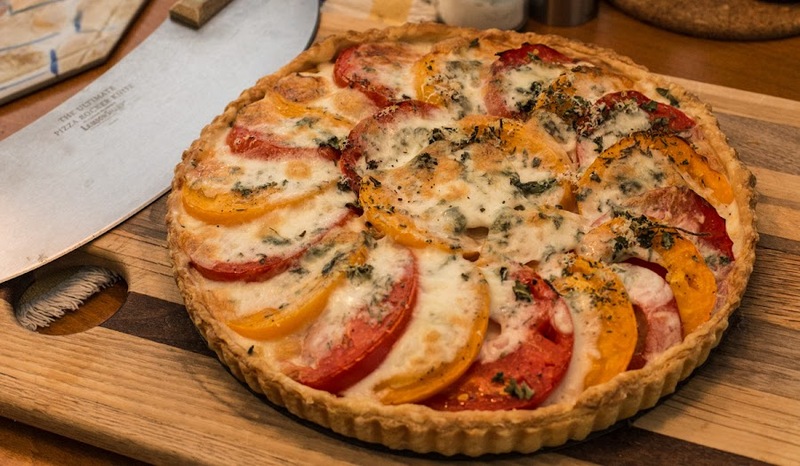 We ate a couple on Friday with mozzarella and basil (Caprese salad). Yum! I'm seeing more and more "end of summer" sights out there. We took Tasha back to the vet on Friday when we discovered she had pulled half her stitches out. Bad dog! She got a few staples in their place (ouch!) and now has to wear the "cone of shame." She doesn't like that one bit, but she's getting used to it. We take it off so she can eat and when she needs to go outside, supervised, of course. I made one of these last year and we liked it, so I made another one for Thursday's lunch. The tomatoes coming in from the garden are beautiful right now and I want to enjoy as many as possible before I start making sauce for the freezer. 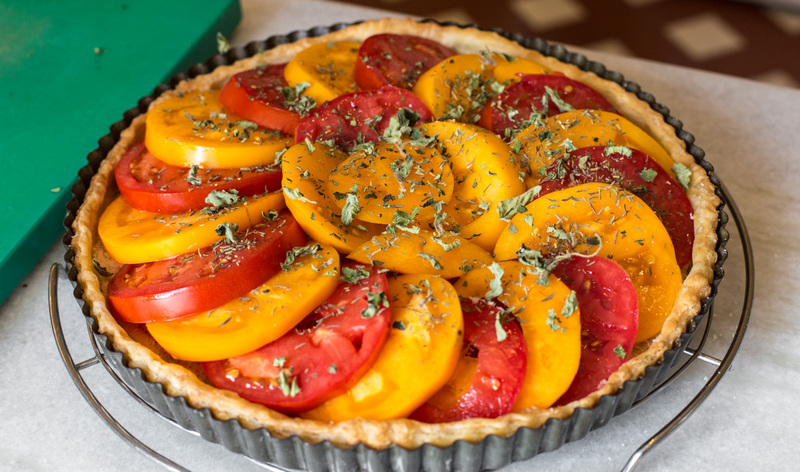 This pie used four good-sized tomatoes, two red and two yellow. We ate half the tart for lunch on Thursday, so there's another half left for over the weekend. First, I used some leftover dough from the freezer. Whenever I make a pie crust, I put the scraps into the freezer. Then, where there are enough frozen scraps, I can make another crust with them. I blind-baked the crust, then spread a generous helping of Dijon mustard on the bottom. The mustard gives a nice spicy flavor to the pie. I covered that with a thin layer of bread crumbs to soak up the juices from the tomatoes. Here is how the tomatoes were layered in before I added the cheeses, sprinkled with home-grown dried oregano. Then I layered the tomatoes in, alternating red with yellow. Next, salt, pepper, oregano, and thyme. Finally I topped it with mozzarella and some grated Parmesan and slid it into the oven for about twenty minutes at 180ºC (350ºF). It's almost like a pizza on a pie crust, and it was delicious! It's been twenty-four hours since we took Tasha to the vet's for her ovariectomie. I guess that's the gender-specific medical term for the more general stérilisation, at least that's what they wrote in her medical record. When she got home, we could tell she was happy. And hungry. We gave her a little food, but not too much, per the vet's instructions. 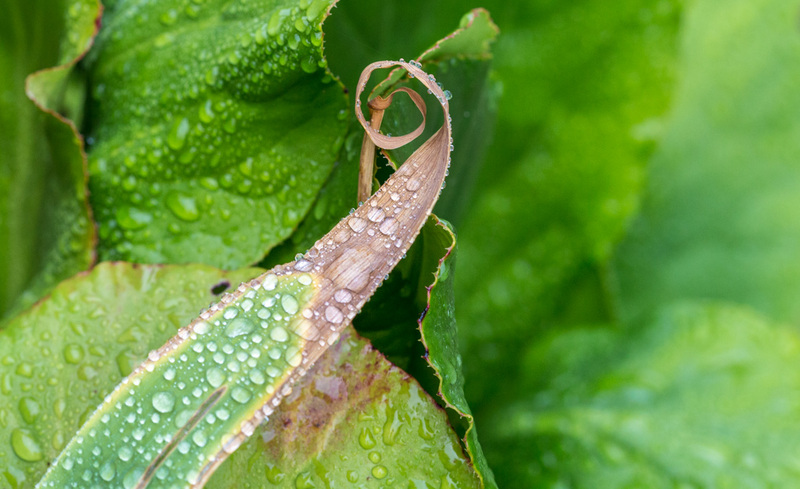 Raindrops on an iris leaf. She's licking her stitches a little, but not trying to pull them out. I'll bet she's a little sore and that those stitches probably itch. After a couple of hours she got groggy and slept on and off, then bedtime, and she essentially slept through the night. This morning she's back on her normal diet, with a supplement of an anti-inflammatory drug to relieve post-op pain for a few days. She'll go back to the vet to have her stitches removed in about ten days. Our challenge will be to limit her activity for a while so her little scar can heal. Ken filled a plastic storage bin with warm water and dog shampoo and set Tasha down into it. This was inside the old shower in the utility room. She stayed calm and let Ken give her a good washing. Then he lifted her out of the water, emptied the basin, and rinsed her off. She was a very good dog. Although she doesn't look very happy, she was actually quite calm and didn't try to jump out of the tub. 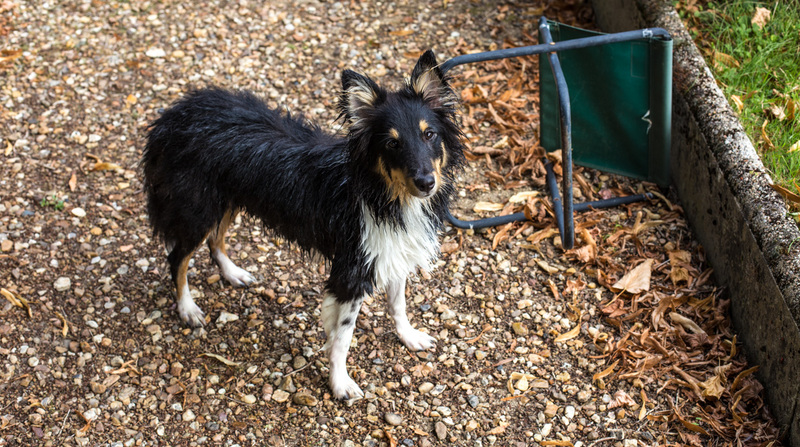 After a brief towel-off, we let Tasha outside to run around and dry. We picked Tuesday because it was predicted to be the hottest day, and we weren't disappointed. I threw one of her balls around for her to chase and it wasn't long before she was essentially dry. This morning we take Tasha to the vet for her stérilisation, as they call it. She'll be quite groggy for a while when she comes home later today. Walks outside the yard will have to wait for a few days, until her scar heals. Another portrait on the deck. She's so photogenic. I got her a new collar on Monday. The old one was somehow broken and came off. I don't know how it got broken, but it did and it came off on the vineyard road. A local man who regularly walks there found the collar on the road and brought it back to us. Today is Tasha's bath day. Tomorrow, surgery! Ugh. Tasha's ID tag was still attached, so I don't have to order a new one. Now she has a new collar and her tag back. I feel much better. The old collar was one that we've had, I think, since 1992 when we got Collette. We used it while she was small, then got her a bigger one as she grew up. We used it again in 2007 when Callie was a pup, then got her a bigger collar after the first year. So the broken collar was about twenty-five years old. The new one should last at least that long. This must be the eclipse day. We won't see it here, except (as I understand it) right around sunset. And then it will not be anywhere near the total eclipse that many people in the US will be treated to. I'm sure we'll be seeing lots of television coverage of the event. 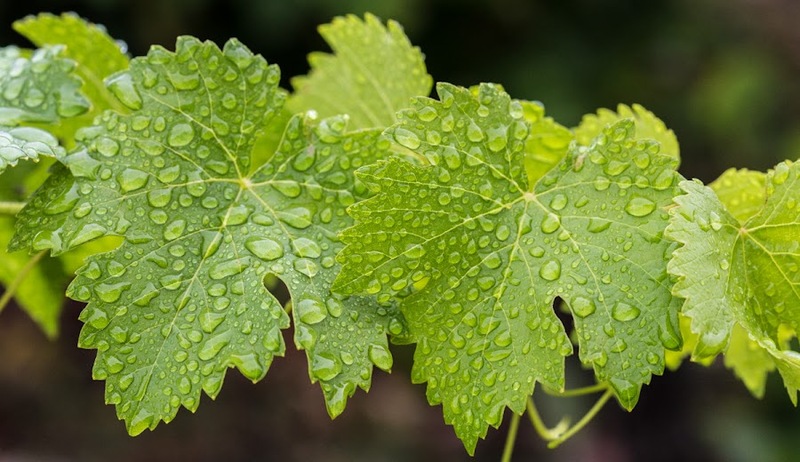 Raindrops clinging to grape vine tendrils. I got to barbecue on Sunday for the first time in a while. The weather is shifting back into a summer-like pattern for the next week or so. We missed it so. The harvest continues in the vegetable garden. As much as I try to pick the zucchini before it gets too big, there is always one that manages to hide until it's the size of a baseball bat. Tuesday is bath day for Tasha, then she goes in to get spayed on Wednesday. And I need to cut the grass again. The firewood is stacked and ready for another season. It only took a couple of hours over two days. I still have to clean up all the mess that comes with the wood, like bark and smaller pieces of wood. Now that it's dried up after the rain, I can gather that stuff up and put it in the kindling pile. The north side of the house is where the logs live, under the narrow section of the deck that wraps around from the front. That leaning concrete pole in the middle of the photo is one end of the clothesline. The leaning boards on the right side are Bert's ladder up to the deck. Tasha is scheduled to be spayed on Wednesday. In preparation, we're planning to give her a bath on Tuesday. The weather is predicted to be hot, so she'll be able to dry outdoors. 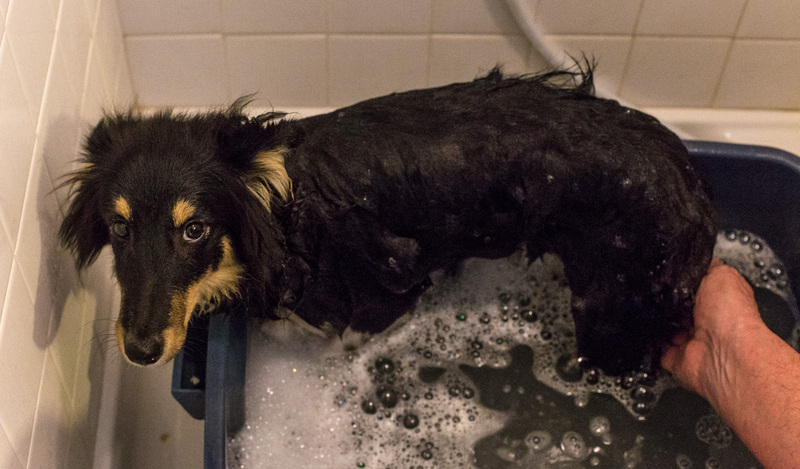 This will be her first-ever bath and we're not sure how she'll react. Should be interesting. Friday turned out to be a rainy day. We need the rain, so that's good. 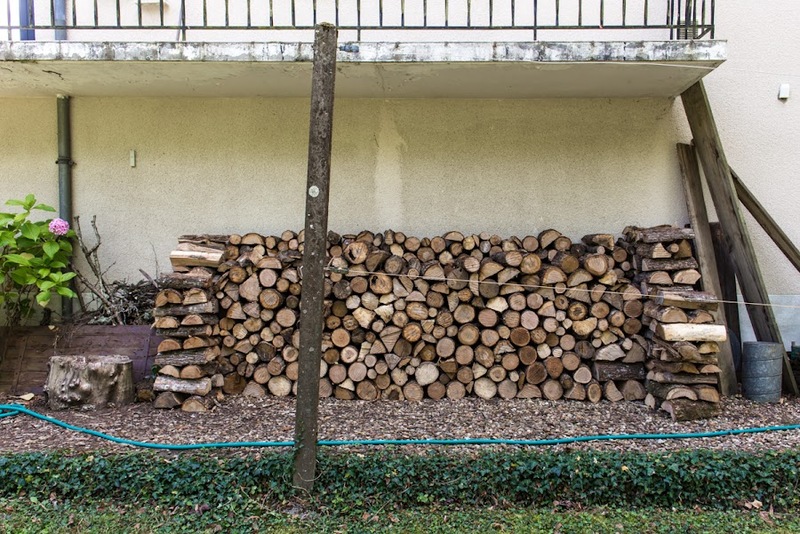 Half the firewood is stacked, so that's good, too. But the other half is out in the rain. Oh well. It won't matter much since, once we get it stacked, it will dry out before we need to use it. It's only superficially wet. A poplar leaf, I think, with raindrops. The rain barrels are filled and overflowing. If it's not hot and dry, we don't really need much water outdoors. The indoor plants need water, of course, so we have plenty. I went out and got a new axe on Friday. The axe I've been using since 2006 is past its prime. The cutting head is no longer attached to the handle and it slides down, making splitting logs a little difficult. So, a new axe for fall. An early Christmas present! Our tomatoes are starting to come in. Soon it will be time to make sauce for the freezer. And the lemon squash are going gangbusters. I'm not sure what we'll do with it all. And the zukes are still producing, of course. All kinds of tomatoes, including romas, juliets, yellows, cœur de bœuf, and fireballs. I have to pick some of the tomatoes before they're completely ripe. Sometimes they're sitting on the ground, and that's not good. Other times they're very heavy looking and need to come off the vine. And then there are the ones that come off by themselves. So I put them all out on the deck to ripen, and they do. It's always iffy, doing a vegetable garden. You never know how it's going to work out when you start. We've had our good years and some bad years, the bad being related to weather or blight, but overall it's been good. I'm starting to look forward to next year. A surplus of lemon squash. We had our annual "bat in the loft" on Wednesday night. It seems that once a year a bat flies into the loft through an open window. Then it spins around the room dodging the rafters while we run around with pillows trying to shoo it out. It only took a few minutes to get it to go out this time. During all the commotion, Tasha sat on the floor and yawned. I told you there would be more raindrops. These apples are not in our yard, but out behind a neighbor's house. The raindrops make them look appetizing. But they're not yet mature enough for picking. This apple is very small. That might be a side effect of the freeze, but I'm not certain. 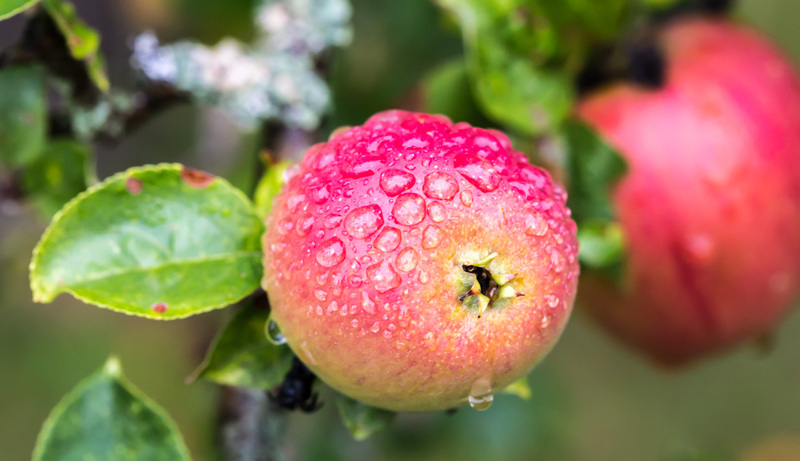 In our own yard, the apples are dropping from the trees as they do every year. I have to pick them up before cutting the grass. There don't seem to be as many as there could be, probably because of the April freeze. Maybe there will be enough to make a couple of pies later this fall. The signs are everywhere. 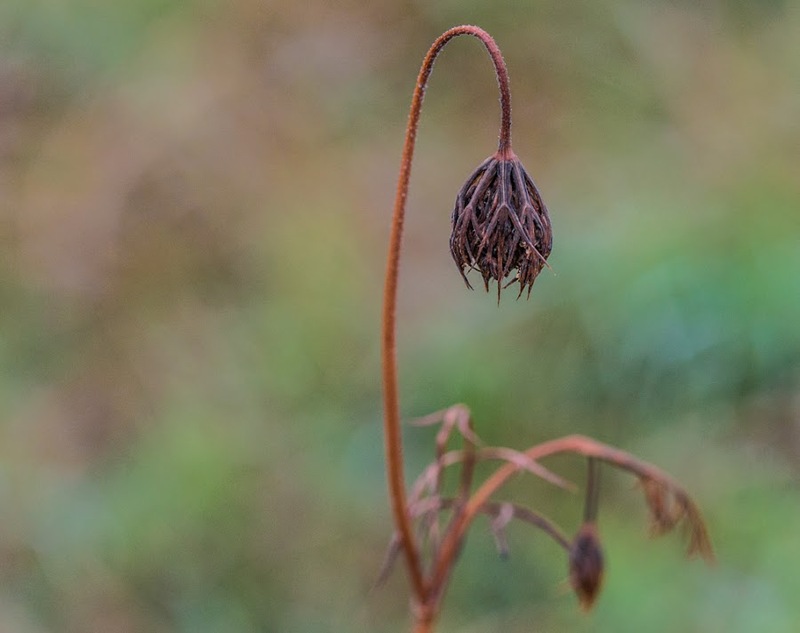 Wildflowers are setting seed and fading away. Grapes are maturing on the vine. Certain poplars are going yellow and dropping their leaves. And the days are tangibly shorter. 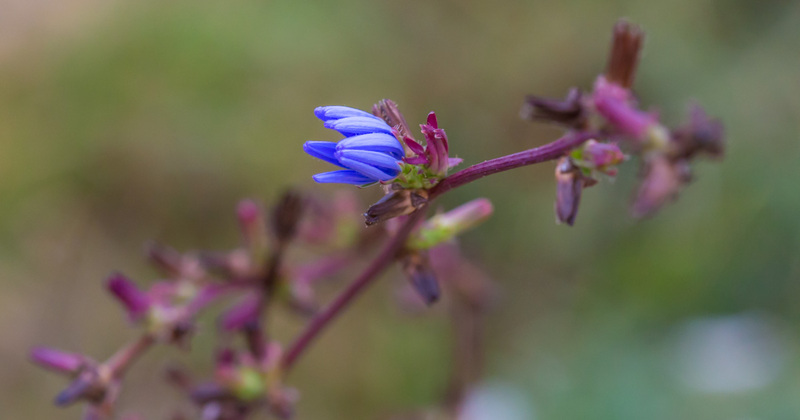 Just one blossom remains on this wild chicory plant. Many others are totally bare already. Schools start up again in about three weeks signaling the end of summer vacations for a lot of people. 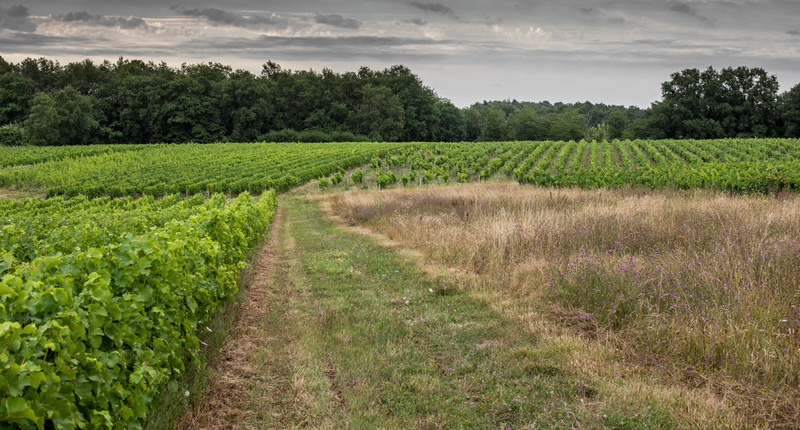 It won't be long before we start to hear the harvesters out in the vineyards. 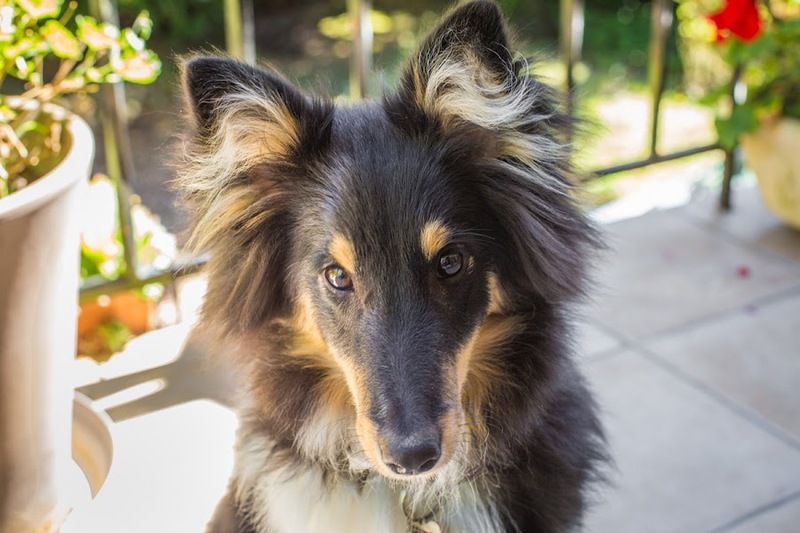 Tasha is doing well on her walks. The only thing I fear is cars and tractors. She wants to chase them and I need to train her not to. Callie was afraid of vehicles and sat down whenever one went by. But Tasha is her own dog and wants to chase everything that moves. Whenever a car goes by our road, Tasha runs out and tries to chase it. She's inside the yard, so she can't get hurt, but if she sees one while we're out, who knows what could happen. No cars to worry about here. But just behind us is the road. Luckily, so far, there haven't been many instances of cars while we walk. I just need to pay attention and keep her close when there's a possibility of a car going by. This fall the harvesters will be out in the vineyard. That will be a challenge. Monday was a relatively hot day, and Monday night was particularly warm. Last week it was so chilly that the heat came on one morning. This morning the low is 22.5ºC (over 72ºF). It's so warm and dry that I went for our morning walk in shorts and a tee-shirt, something that happens only a few times a year. And whiskers on kittens! Oh, forgive me if I've used that one before. We had some light rain on Saturday night and on Sunday morning everything was covered with little raindrops. So there will now be lots of photos with raindrops. One thing I noticed on my Sunday morning walk was how the flowers and plants and trees are starting to look all autumnal. We've still got more than a month until fall arrives, officially. I guess we had an early summer, so now we're going to have an early fall. And I'm hoping for a short winter. Ha! That's what I thought when I saw these bare branches among the oaks. It looks like it's dancing, doing its own thing. 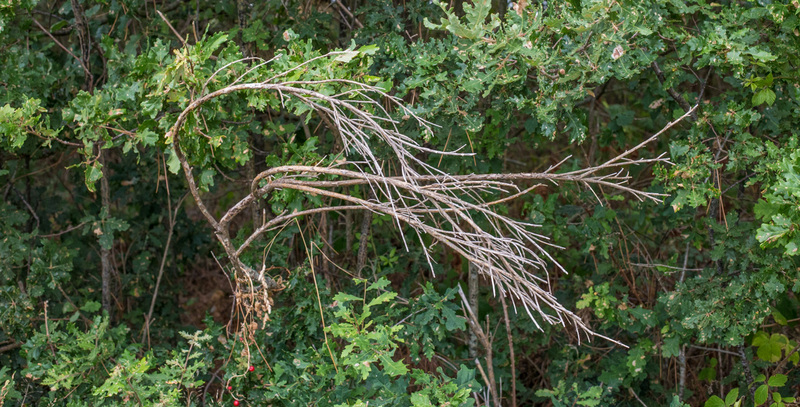 None of the oaks are bent this way. I wonder what it was. Last night was still and muggy, even though it wasn't all that warm. I didn't sleep well, even with a fan on. Tossed and turned a lot. I think tonight I'll open a few more windows and use the bigger fan to get the air moving more. 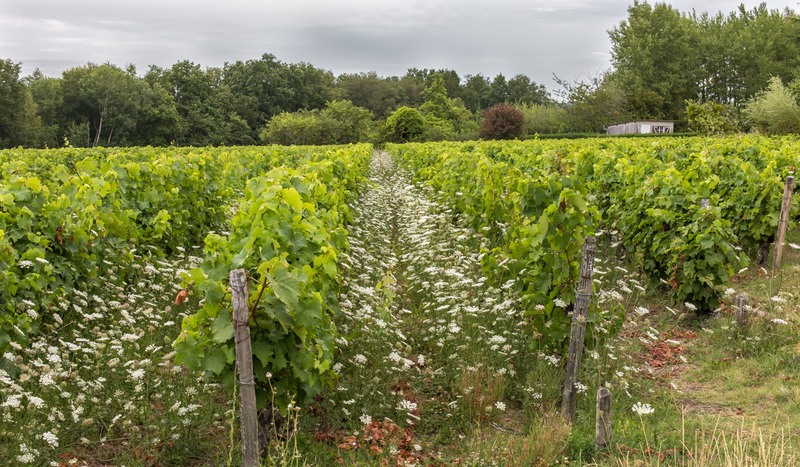 This is the season for Queen Anne's lace, known in France as carotte sauvage (wild carrot). It's growing especially thick this year. In fact, I don't remember ever seeing the spaces between the rows of grape vines this crowded with it. It's probably just that the growers are not mowing it down or are cutting back on the use of herbicides. The vine parcel just outside our back gate. That's our garden shed on the right. Of course, not all the parcels look like this. Some are quite bare (at ground level) from herbicides, others have been plowed to uproot the weeds and wildflowers, and still others have been mowed to keep the weeds under control. 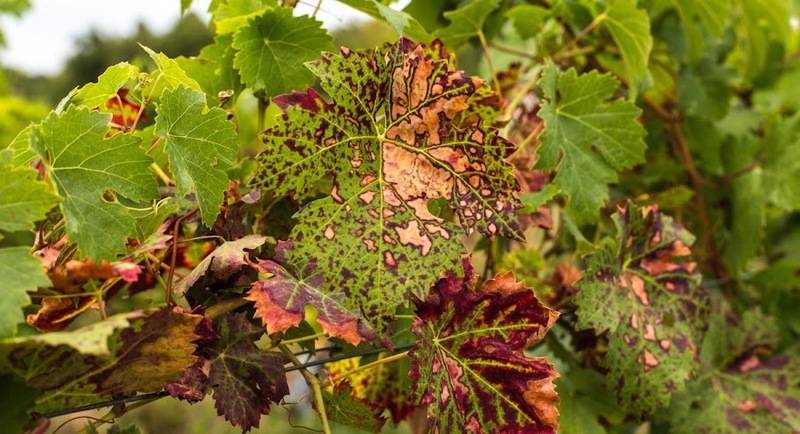 I wonder what difference it all makes to the vines (although using fewer chemical herbicides is probably a good thing for the environment over all). This is kind of place we walk with Tasha every day. We often take the dirt roads, like this one, that the growers use to get into certain parcels. 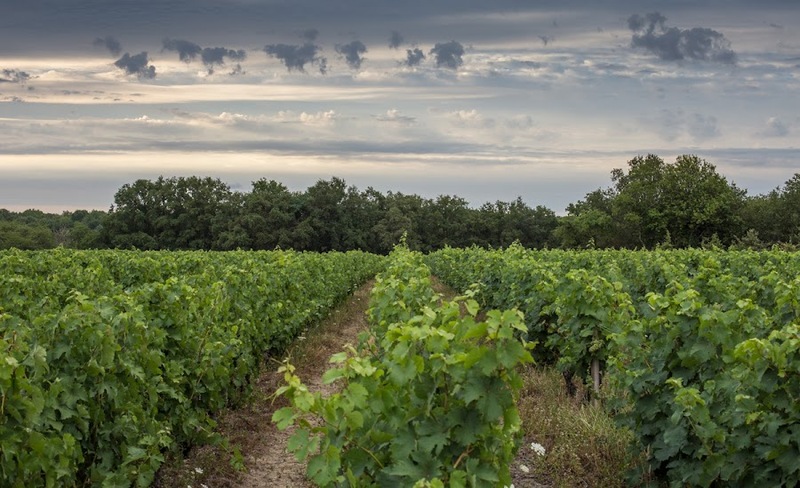 Just as often, we walk in the space between the grape vines and the woods that the tractors use to turn around at the end of the rows of vines. Tasha is learning to wait while we stop for photos. We walk in a lot of sandy places. When they're wet, well, you can imagine. We've been lucky (in a sense) this year because it's been pretty dry over all. All too often these paths are wet, either with heavy dew or just plain rain. Wet paws pick up sand and mud. Callie got very dirty and needed a wash-down nearly every day. So far, Tasha doesn't seem to get as dirty as Callie did even though she's much closer to the ground. Our evening walk on Thursday was rainy, but all I had to do was give Tasha a quick once-over with a towel to dry her off. It rained a lot on Wednesday, mostly in the middle of the day. While it's more than a month away, it feels a lot like fall right now. Fortunately, neither one of us had to walk Tasha in the heavy rain. Just a few sprinkles here and there. Dark puffy clouds march across the sky above the vineyards. The squash from the garden are starting to pile up. We have a few plans to use some of it and to give some of it away, but we're probably going to have to do some freezing soon. Not to mention the green beans. We have a bunch to blanch and freeze (and some to eat today), but I need to go out and harvest some more before they get too big. And the tomatoes are starting! It's been a strange summer, so far. Even though we've had brief periods of rain, I think the region is under a drought advisory. There are water use restrictions in place, but we haven't been notified of anything specific. I read that in certain areas, watering lawns and gardens is forbidden, but people can water their vegetable gardens during certain hours of the day. The grasses are dry, otherwise it doesn't look like a drought. But looks can be deceiving, right? The rain we do get is not enough to alleviate the drought conditions over all, but it does put a damper on our walks. Tasha and I will probably be walking entre les gouttes (between the raindrops) this morning. She was ready for her close-up. So I took it. Isn't she the cutest? 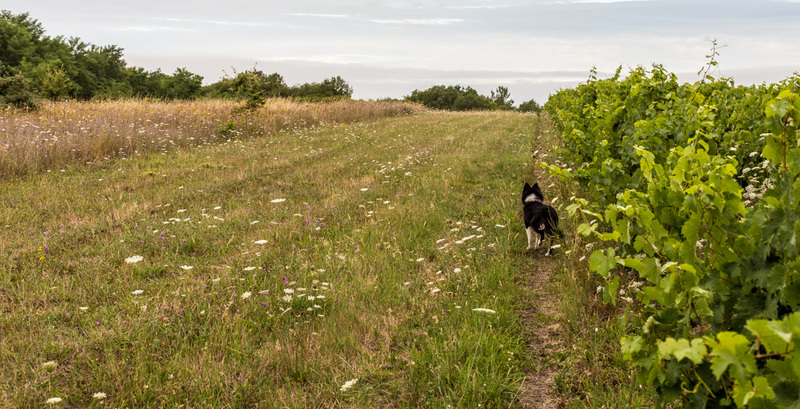 On one of our recent walks, she saw a deer in the vineyard and chased it for a while. Now she looks down every vine row she passes, looking for another one. I was in the right place at the right time with the right lens. She will never catch a deer, of course. But her herding instinct forces her to chase them. And anything else that moves. 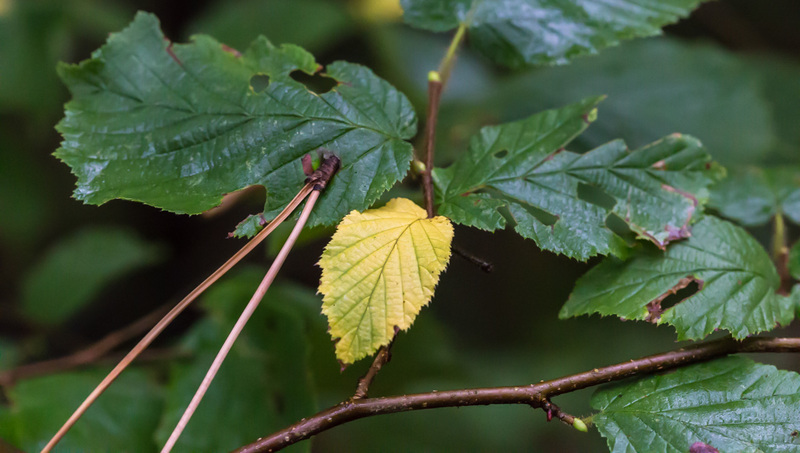 It's hard to see leaves turning color in early August. Summer isn't over! Fortunately, though, this is pretty normal. Here and there in the vineyard, the leaves on certain vines will start to turn very early, even though the vast majority are still a very lush green. And so are the trees. So fall is not here yet. Grape leaves turning color in the vineyards behind our house. I don't know what causes this to happen, but I see it every year. And some vines die altogether during the growing season. Most of those will be marked and yanked out after the harvest then replaced with a new vine. In some cases, a long cane from the neighboring vine will be buried in the ground with a few buds poking up above ground. The cane stays attached to its parent and gets its nourishment that way. Roots will grow below ground and a new vine is the result. I read that that kind of propagation is called "layering" in English, marcottage in French. I picked the first tomatoes from the garden on Saturday. They came from a volunteer vine, one I didn't plant, that sprouted from a seed dropped last year. 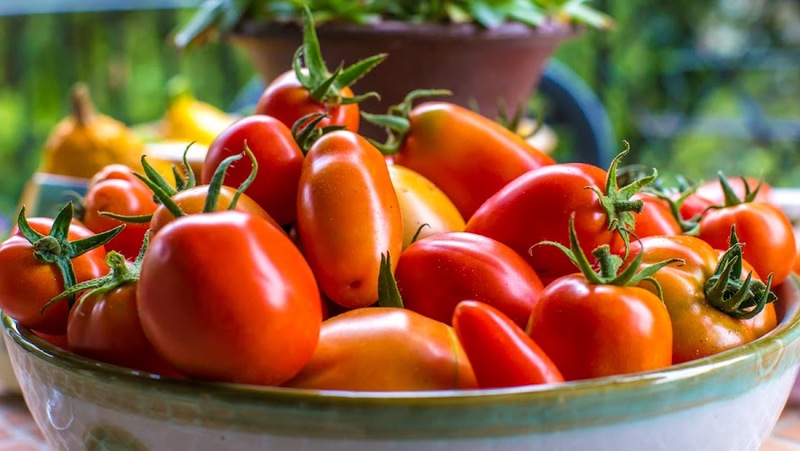 The tomatoes are small Juliets, like cherry tomatoes but long instead of round. I also picked a few more lemon squash, another zucchini, and a big basket of green beans. Green tomatoes on the vine. Don't mind the weeds. The rest of the tomato crop is starting to ripen. There are three or four 'maters going red out there. Soon we'll get to enjoy fresh ones for salads and sandwiches and stuffing and, when they get too numerous to handle (if we're lucky), tomato sauce for the freezer. This is what our hamlet looks like this time of year. Summer is in full swing, and the weather is, as usual, unpredictable. But the vineyards look lush and very green. Tasha has a good time running under the vines and up and down the rows. Our hamlet with the Cher valley in the background. Ken will tell you more on his blog, but on Friday I drove up to Contres and bought a new freezer. Ours is getting up there in years and we feel like we should have a new one in case the old one decides to die. The new freezer is not a chest style like the old one. It is tall and has drawers and shelves, like a refrigerator. Maybe that way we won't have as many UFOs (Unidentified Frozen Objects) lurking down in the depths. I mentioned the other day that I've seen the red grapes starting to turn color, so I went out on Thursday with the camera. It's hard to tell how things will go this year. First there was the April freeze, then the alternating heat waves and cold spells. Some of the grapes look normal, others look smaller than usual, and some parcels look like they have very few bunches in them. 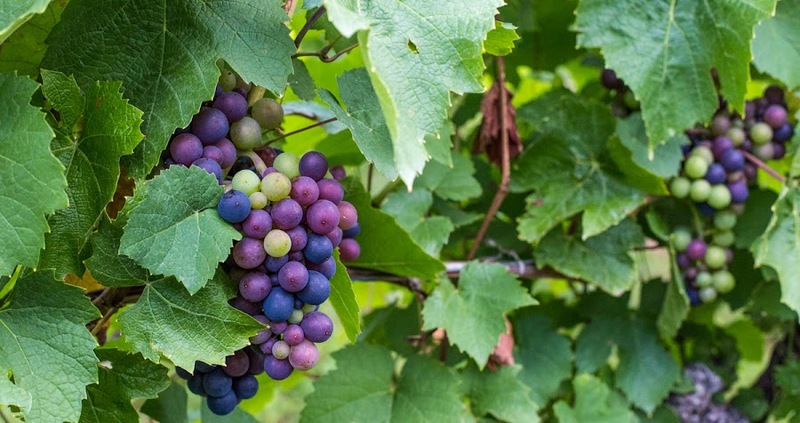 These red grapes go from green to pink to "blueberry" blue in the course of their ripening. It must be very stressful to be a grower and to be dependent on the weather for your livelihood. Very few years are perfect, and the years can be very different one to the next. Temperature, rainfall, sunlight, storms, there's always something to worry about. When your garden gives you summer squash in abundance, you have to find different ways of dealing with it. One way is to give some away to your neighbors, which we have done. We're lucky to have generous neighbors who share the fruit from their plum trees with us, so it's nice to be able to give something back. 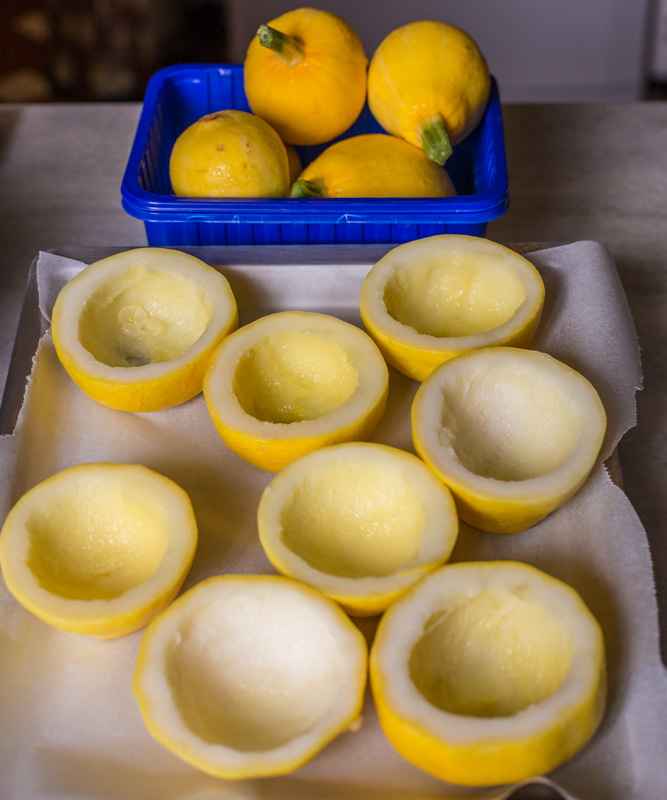 Lemon squash cut in half, steam-blanched, then hollowed out, ready for stuffing. 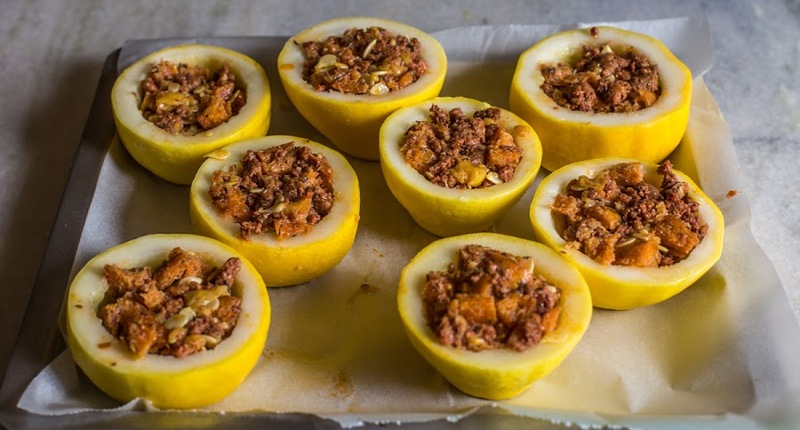 Next to slicing and grilling, stuffing summer squash is one of my favorite ways to eat them. These are small round lemon squash. We only have one plant (given to us by a friend), but it is prolific. The stuffing in this case was easy: Ken cut open some spicy chorizette sausages and cooked up the meat with squash pulp and small bread cubes. The sausages are made by the butchers in our local Super U market and they're often on sale in the summer months. The stuffed squash went right into the freezer to be eaten in the coming weeks. We also have three standard zucchini plants producing now, and we've grilled and stuffed them as well, most recently with a ground chicken stuffing (Ken posted about them on his blog today). That was tasty. If we get tired of eating the squash, I will grate and freeze them for making things like zucchini bread and fritters in the fall. On Monday, Ken, Tasha, and I went across the river to enjoy lunch at the home of friends C. and M. who were hosting frequent visitors from Australia, L. and S. (who are also frequent commenters on this blog). The weather cooperated and we spent the whole afternoon under the canopy in C. and M.'s back yard. Lunch started with a little bubbly and some nibbles. The entrée dishes were endive leaves stuffed with crab salad, and a generous platter of smoked salmon. Next was a palate cleanser of apple sorbet with calvados (apple brandy). The main course was a tajine of chicken with apricots and prunes, served with couscous. For dessert we had a chocolate mousse followed by coffee. 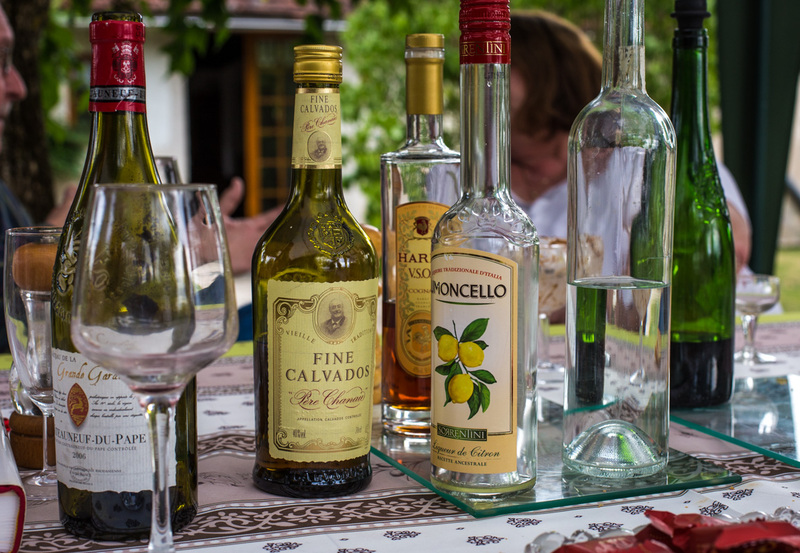 Then M. brought out the after-dinner drinks. It was a wonderful afternoon and we enjoyed seeing everyone again. Tasha reacts to Trump's latest tweet. 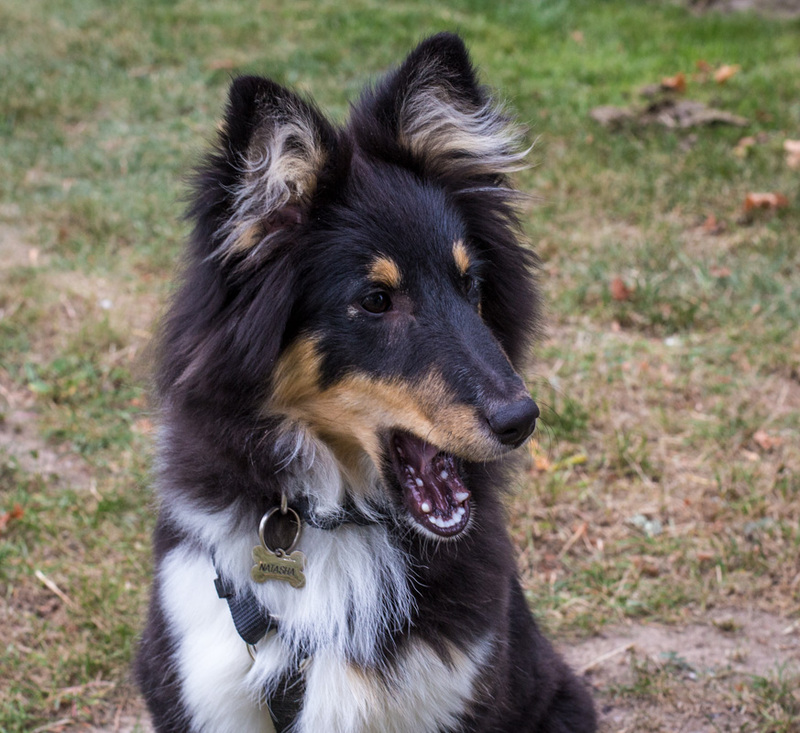 I can't tell if she's expressing shock or just yawning. We wore her out yesterday by taking her to some friends' home for lunch. She was a very good dog all day, exploring the grounds and generally being friendly and cute. But because we were out, she didn't get her usual mid-day nap. When we got home last night, she crashed and slept without a peep through the night. Neither the early morning thunder nor the passing garbage truck could rouse her out of bed. If you look closely, you can see Tasha's name tag. She's also wearing her stylish black harness. I picked a whole bunch of green beans on Monday morning, so today we'll be working to preserve them. Most likely they'll get blanched and frozen, but we'll probably keep some out to eat fresh.